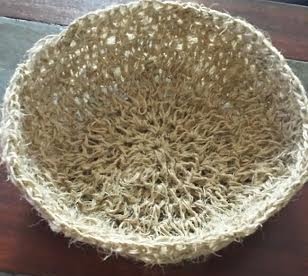 Jute is so expensive, but I was determined to find something to crochet with to achieve the same. 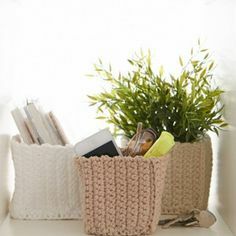 natural looking baskets. I bought 29,000 m. of cheap sisal twine, that rough, brown twine we use in gardens. I combined two strands of an orange yarn for my first attempt. I used just the twine for my second attempt. It is stiff, rough going, but the result is remarkably delicate looking, even pretty. Even better the baskets are flexible, malleable- you can reshape the baskets, turn then inside out etc. for different looks. 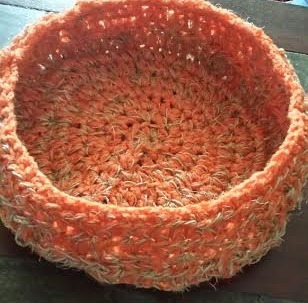 Just crochet the same rounds you do for anything from hats, baskets, rugs, doll heads….. when the bottom is as wide as you want, quit decreasing and start crocheting the sides. Holding 2 strands of jute twine, ch 3. Begin working sides. The right side will always face you as you work. I’ve noticed this can be confusing for some who post photos with the right side turned inside. For this bowl that’s exactly what we’re doing, but don’t turn inside out until you get to the last round. For the sides I used the same technique as with the other baskets I’ve posted. For the next round, work under the loop on the back side of the stitch. This creates the seam separating the bottom and sides. Rnd 8: Working under the loop on the back of each stitch, work hdc in each st around. Join. Rnd 9-10: Repeat rnd 8. Rnd 11: Working in back side of stitch of previous rnd, sc in 12 sts, ch 6, skip next 5 sts, sc in next 23 sts, ch 6, skip next 5 sts, sc in next 11 sts. Join. Now turn bowl inside out. The last rnd will be worked using reverse sc. To do this you will be working to your right on the round… Basically backwards. Rnd 12: Ch 1, Reverse sc in 11 sts, 7 reverse sc under ch 6 space, reverse sc in next 23 sts, 7 reverse sc under ch 6 space, reverse sc in last 12 sts.